"Just out of interest, how badly does someone have to be tailing us that I can tell they are doing it?" Brokk queried, frowning back along the trail. "We only left the farms ten, fifteen minutes ago. That`s pretty poor by any standard, isn`t it?" "They aren`t even trying to be hidden, Brokk," Isolde said sourly, deliberately not looking behind them. "Subtle is not something they can do even if they wanted to. When they pluck up their courage and actually catch up to us, you`ll have the dubious pleasure of finding that out for yourself. For now, we keep walking. I doubt we`ll have to wait long." She was right. After a mere two minutes, the hoofbeats were audible, and five more after that, their owners trotted up alongside. Two of them, dock-tailed piebalds with the characteristic heavy fur and pale flesh of more northerly breeds, were twin stallions likely only in their first few years of maturity, bearing crude clubs that had clearly been carved straight from fallen tree trunks. The third was a bay mare with strange wine-dark skin and silver threads wound through her mane and tail, her slender build and soft features showing her to be even younger than her companions, and over her shoulder rested a barbed hunting spear that would be more akin to a halberd in the hands of a smaller creature. "A fine g'morning to you, mates," the left-hand stallion announced cheerfully, his accent broad enough to be a canyon. "D'you mind if we tag along for a bit?" The right-hand one, perhaps seeing Isolde`s expression, hastily added: "Only if you fancy having us along, a'course. We don`t want to be rude. Just thought if we`re all having a go at the same lot, why not do it together, whaddaya reckon?" Aidan looked the centaurs up and down, uncertain of quite what he was seeing (or hearing). "You want to help us fight the dark folk? Can`t say we`d normally turn down the help-" Next to him, Isolde spat contemptuously. "-but you seem a little on the young side. It will be dangerous and bloody, and we don`t want to have to look out for you as well, ah..."
"Oh! Oh, now where are our manners?" the left-hand centaur exclaimed, clapping a hand to his forehead in shock. "Here we are, offering up to take up a shout or three, and we ain`t even given our names! We are so sorry, mate! Comes of us all knowing each other from when we were just hoof-scratchers and ankle-biters. Hard to say how often we actually need to know a new name, but - ow!" "By Dekk, shut your gob, you great yabbering larrikin!" the right-hand centaur interjected, giving his brother another clip around the ear for good measure. "Intros before the goss, you know that! So, I`m Harrah, and that`s my brother Makkah. Pleasure to meet you, not so much him, right? Still love you bro. And this here lovely bessie is Zindri." Makkah let loose a very equine snort of shock, his eyes going wide, and then Harrah realised what he had said as well, though too late to take it back. The spear slipped from the mare`s shoulder, twisting in her hand almost of its own accord. It brushed gently along Harrah`s belly, the vicious barbs just plucking at his hide without piercing it, and he immediately stopped talking. In fact, he stopped moving in mid-step, freezing in place as though paralysed by a spell, whilst the mare leaned in close. "Call me a bessie again Harrah," she breathed, the implied threat obvious to all. "Or did I mishear you? I must have just misheard you. You and your brother have such charming drongo accents but they are so hard to...penetrate." "I meant beaut, proper beaut, bestest beaut! Best beaut. On my honour, Zindri." The mare left her spear dangling below his belly for a few seconds more, then withdrew it and gave him a punitive rap on the haunches with the shaft. As Harrah and Makkah breathed sighs of relief, hooves scuffing at the ground nervously, she glanced over at Aidan. The half-elf straightened up instinctively, catching in her eyes a maternal look of command he was familiar with from his childhood. At that moment, he wished he knew more about the social structure of centaurs, because so far as he was aware, they were not usually matriarchal. "I am too old to obey every order Mother gives," Zindri said simply. "And since these two were not told to stop following me about, they cannot stay behind as do the others. Go ahead before us, or have us walk at your side, but we will fight our enemies with or without your permission. Less still your blessing, little bridler." Isolde`s lips peeled back from her teeth, almost hissing at the centaur. Then she took a deep breath, turned her back on them, and strode off in a huff. Over her shoulder, she tossed a parting: "So are we hunting dark folk or each other?" The centaurs, knowing they had won, smiled at each other and walked after her. Aidan, knowing that what little authority he ever had over a situation was absent from this one, shrugged at Brokk and took up his own place in the procession again. This had suddenly become much more complicated. They had spent less than an hour following the trail when the raiders` camp was revealed to them, a chaotic and slovenly heap of hide tents and crude huts nestling in a small wood at the bottom of a hill. Thankfully, the group was neither upwind nor downwind of the camp, thus keeping both their scent from the flaring nostrils of the red-skinned irzuk tracker-orcs ostensibly on sentry duty, and the dreadful stench of butchered captives from them for a while yet. Nothing could be done to drown out the sounds that reached the vengeful group, however, and Isolde needed a good minute to settle her nerves before she could sneak closer to scout the place. When she returned, her face was ghost-pale, and tears had wound their way down her cheeks. "The monsters have slaughtered all but a few of the men," she whispered, her breathing fitful. "The rest, the women...I can`t describe...the lucky bled out. Before the - oh, gods - the shamans got to them. I think if unbound, unguarded, most could even run." Embla, until now remarkably calm and silent, suddenly moved, staring blankly at Isolde. Her voice was low and empty of emotion as she asked: "Run? They can even walk? Why?" Isolde shuddered, trying to shake the image from her head. "I saw one girl. The shamans stopped the bleeding. Gave her back to be used again. No fun if...if there is no wriggling. No crying or sobbing or begging." The others growled their loathing, except for Embla, who was now just beginning to frown. "Begging. These women are begging? They can speak. And stand and walk. What do th-"
"What does any of that matter?" Aidan interrupted savagely. "Those abominations must be wiped from this world. You three, however quickly and quietly you can get to a flanking position, do it and wait to strike when the attention is on us. Aim for their leadership wherever possible." Harrah and Makkah looked to Zindri for confirmation, and when she nodded, the centaurs hurried away, moving respectably stealthily for creatures of their size. In a couple of minutes they were out of sight somewhere on the edges of the camp, and Aidan steeled himself for the patience needed to wait until they were sure to be in a good position. He knew every second spent here was another second of unimaginable torment for the captives, but he told himself over and over that to rush in might doom the rescue attempt entirely and condemn the victims to the nightmare for the remainder of their lives. He was so focused on this mantra that he very nearly did not notice when Embla took several steps back along the trail, planted herself firmly alongside it, and turned her back on them all. Her sword remained sheathed, her arms folded across her chest, and there was a dreadful clarity in her eyes as she ignored Brokk when he demanded to know what she was doing. It seemed impossible, but the now-literally rabid berserker evidently had no intention of joining battle! Puzzled by this behaviour, Brokk glanced over at Aidan for permission, and when the paladin nodded, gesturing furiously at their target as if to say 'Obviously, we need everyone for this! ', Brokk readied himself to speak the words to a spell he had never thought he would need to cast on a friend. Timing would be key to induce the magical compulsion. Embla had to be very nearly upon the camp when Aidan and Isolde broke cover to launch the attack, otherwise the likelihood of her simply abandoning the fight - formerly a thing they had all deemed next to impossible - was just too high. A short while later, Aidan, trusting his friend to know when the time was right, began to creep after Isolde, following her wordless directions to make it slightly easier for him. Brokk watched their progress, trying to calculate when they would be perfectly placed to launch a surprise attack, so that he could determine when to drive Embla in that direction. At any other time, this might have been an interesting intellectual challenge. At this particular one, however, it was a horror all its own, and Brokk dreaded what might happen if he misjudged when to cast the spell, or worse - if Embla should simply resist it, as was always a risk when using this sort of magic on anything more intelligent than a fungus. In theory, when she felt the first touches of the spell caressing her mind, she could allow it further access without further struggle, but in her current mood, rejection was essentially guaranteed. As the moment neared, the wizard found himself hoping that the disease had weakened her mental defences enough that the compulsion would be able to take hold no matter how strongly she fought against it. The moment came, the spellwords spoken, and Brokk held his breath in anticipation as Embla shifted her weight. With a sharp jerk, she rose to her feet, almost as if she was a puppet whose strings were being played. With similarly sharp movements, she turned around, looked Brokk up and down, drew her sword...and then thundered towards the camp, hurtling down the hill at a speed that was as dangerous to her as to anything she might crash into at the bottom. Nonetheless, Brokk concentrated on maintaining the magic`s urging, forcing one of his dearest friends to charge right into the heart of that den of monsters, releasing his hold only when she passed the outermost tents and even to attempt retreat would require bloodshed. In any battle, the element of surprise is one of the most powerful tools available to a combatant. Certainly the opening seconds of this battle were the most surprising - and terrifying - any of these dark folk had ever experienced. All but a few were still in the throes of their unspeakable pleasures, or basking in the aftermath, with neither weapon nor armour to hand. Embla, moving fast enough to be little more than a giant bronze blur to the startled irzuks, let her sword collide with the nearest sentry first. He was instantly impaled on the blade, fully lifted from the ground and carried away on its hilt, breath and life knocked out of him mere seconds apart. As Embla slowed, Brokk`s compulsion starting to lift from her, the sentries turned in shock to face this intruder, some of the more disciplined taking deep breaths to roar out the alarm. Two of them died before the sound even escaped them, their skulls caved in, as the wrathful paladin burst from cover and brought down his warhammer with all the strength of righteous fury. A third collapsed, shrieking at the agony in his heels, before he too was silenced by Isolde`s flashing daggers. With this first death dealt out, the halfling ducked out of sight and began the work she had been trained for. As more of the raiders emerged from their lairs, blinking and confused, many still struggling to get back into their clothes, never mind the protection of armour, she struck from above and below and behind, spilling their lifeblood before they had a chance to react. As the clamour of battle rose up around her, Embla realised what had happened, and what had needed to happen in order to get her here at this moment. The rage grew in her more swiftly and powerfully than it ever had before. The dead orc still hanging from her sword was cast off without a second thought, and she replaced it immediately thereafter. What little part of her thinking self remained decided that this was as valid a tactic as any, and so continued it, at intervals hurling the bodies of the slain at their fellows. The goblins, possessed of greater survival instincts than their larger cousins, were the first of the raiders to break rank and attempt to flee. Aidan, remembering how similar beasts had once nearly killed him, sprinted after them in eager pursuit. He had a weapon greater than a mere mace now, and put it to deadly use, pulverising one of the wretches with every strike. It would not have been enough on its own to prevent some from escape, but a strong dwarven voice rose above the tumult, uttering crackling words of power. A wall of fire burst from the earth in front of the goblins, blocking their paths out of the camp, and forcing them to confront the paladin - though a few, more scared of the half-elf than of the flames, took their chances in a daring and futile leap through the inferno. These died before their charred remains even landed on the other side. In place of such a death, Aidan granted the remainder a more merciful passing. What little semblance of order remained was lost as a pair of excited whoops rose up from the sides of the camp, and from the rear a hideous noise that seemed a cross between a donkey`s bray and a woman`s scream, as the centaurs arrived. Though crude, the clubs the stallions bore were very good at battering their enemies into the ground, where they were promptly trampled. Zindri`s barbed spear was no less brutal, leaving horrific rents in its victims, and the ghastly sound she made with every breath made more than one creature clap their hands to their ears. Now even the orcs tried to break away from the melee. More fire sprang up to corral them as Brokk encircled the camp with incendiary barriers, or even as it spread naturally through the trees and crude structures. Isolde would emerge smoke-darkened and scowl-faced from some of the latter, bullying a shaking captive into running to a vaguely safer location before they too started to burn. As could have been expected, the shamans of the raiders had retreated to the rear of the camp the moment they caught wind of the attack. Such was the privilege of leadership, as was the right to exact their own brand of punishment on the trespassers for daring to disturb them - once said trespassers had been suitably worn down, of course. As a result, they were taken completely by surprise when Zindri appeared among them. Her spear and hooves flashed like lightning, puncturing throats and crumpling chests, stifling every attempt at a spell from the few with the presence of mind to try one. Most of the shamans merely panicked. The sight of their leaders in such a dire state did nothing to bolster the morale of those dark folk trying to marshal their courage. Desperate to escape the butchery, they began to fight each other to reach what they hoped was the best way out of this impromptu slaughterhouse. When Brokk lowered the first wall of fire he had erected, many began to flee in that direction. Aidan and his warhammer put pay to them easily enough, and he moved in to help the centaurs hunt down the last of the shamans. With a clear way out of the burning camp, Brokk joined Isolde in herding the rescued villagers to safety. Throughout all this, Embla was a whirlwind of destruction, her berserk rage exacerbated by the disease polluting her veins, and she lashed out at everything her gaze fell upon. By now, all the surviving raiders were hobgoblins, undoubtedly legion-bred by their discipline and coordination, and the majority of these had attempted to surround Embla and wear her down before moving in for the kill. Inexhaustible as Embla now was, the effort only resulted in their blades being dashed from their hands, and the cover they ducked behind shattering under her frenzied assault. There was nothing disciplined or coordinated in the way she dismembered them once exposed. In the centre of the slaughter, Harrah and Makkah were taking it in turns to kick a stunned, bloated bazok back and forth between them, iron shoes splitting the skin and splintering bone easily. As its troll blood strained to heal the grievous injuries, the stallions finally combined their strength and knocked the brute into the spreading flames. For a few seconds, the monstrous hybrid shone like the beacon of a lighthouse, before it was consumed. Four figures emerged from the inferno, the centaurs streaking ahead of Aidan before the surrounding flames lost them their fight against the horse-half`s urge to flee, and regrouped near the top of the hill, where the remaining villagers were huddled together in mingled joy and disbelief at their miraculous salvation. Brokk immediately spotted the problem. "She`s still down there!" he gasped, and one by one the others followed his gaze downwards to the blazing wood. The distance was not so great that the bellows from Embla could not reach them, or to miss flashes from her sword as she continued to hack and slash, mindlessly and without regard for her own safety, at every tree and hut and flaming corpse within reach. The burst of clarity that had briefly possessed her was obviously gone, and nothing now remained but the rage, continually fuelled by the burns she was suffering every moment she remained. Harrah muttered in awe: "Gone off like a frog in a sock! We can`t just bail, fire be damned. She`ll be carked else! Zindri, d'you wan'us to grab a goose, me and Makkah together, whaddaya reckon?" "Dekk blind me, don`t you be vol'ting me into this!" his brother protested angrily. "It`s my shout anyway, I saw you rushing in first, and out first too, you overgrown pansy. On your hoof mate, it`s me who`s going first." The stallions struck each other across the head and shoulders, open-palmed and just lightly enough to sting, as they hurried back down the slope, still bickering and with Makkah taking the lead. Brokk had seen similar behaviour among miners when they were about to mount a rescue following a cave-in, and knew it for the deliberately false bravado that would hopefully keep their minds off the danger they were heading into. When Aidan made a move to follow, Brokk held up a hand to stop him. "They can move faster without you," he explained. "If they can resist the panic, it will take both of them to bring Embla out of there anyway. Don`t make it harder by having them worry about you, when they`ll barely be holding themselves together as it is." Aidan ground his teeth, knowing that this was the truth but not feeling any better for it. Turning his back to the flames below was one of the hardest things he had ever done. He reminded himself that there were victims of brutality here that he could help right now. Though most of the villagers could currently walk unaided, they had suffered so much both physically and mentally that they were likely to collapse at any moment. It would only get worse, especially once the shock really hit them and they had the time to pause, breathe, and think back on the trauma they had experienced. Best if they did not get a chance to do so until they were all back in their homes. He opened his mouth to issue the order, but Zindri got there ahead of him, taking charge with the effortless ease of one who was born to command. Her greater stature drew the eye better than the half-elf`s anyway, and the obvious familiarity the villagers had of her made them latch onto to her words like a drowning man onto rope. Every instinct he had screamed at him to flee, but Makkah bore straight into the flames without hesitation, and his brother came right after him. Ahead of the pair, a tree began to fall, just slowly enough for one to get through the gap, but not the second. Being in the lead, Makkah purposely slowed his breakneck pace, bracing himself more for the primal terror, rather than the pain, that would momentarily assault his nerves. He threw up his club, bracing it against the creaking trunk, leaning his full weight into it. Had he thought before the urge to flee was almost overwhelming? Belief formed through ignorance! Now, desperately trying to hold his ground, fire dripping around him, Makkah truly understood the nature of fear. Yet he stood his ground anyway, his entire body flinching at every spark that drifted past him. No five stallions in their prime could have stopped that tree from coming down, but stopping its fall was not Makkah`s goal. One, two, three seconds. That was all it took, and Harrah passed him. The air was too smoke-filled to waste precious breath on calling encouragement, so no words were spoken. Makkah exerted himself once more, pressing up against the club. For an instant, the tree was held motionless, roots aflame and cracking apart, and the young centaur hurled himself clear before the whole thing came down. He caught up with Harrah far too soon, his brother bucking frantically as though he were a common yearling being broken in, beating madly at his mane where a branch had become entangled and bound him to another tree. Makkah reared up with a scream, barely avoiding the lashing hooves that had nearly split his face in two, and almost overbalanced straight into a hut that was somehow still standing. There was no time for niceties. He backed up a step and swung his club, smacking Harrah on the haunches so that he was the one who lost his balance and fell. The branch was a sturdy one, but not enough so to bear the full weight of a centaur stallion, and it broke immediately. Though Harrah yelped in pain as a fair portion of his mane was torn free in the process, the sudden shock of it proved enough of a jolt to bring him back to his senses. He was scrambling back to his hooves, leveraging himself up with his own club, when he spotted movement out of the corner of his eye. Harrah turned his head to see more clearly, and felt his bladder empty. Encircled by dancing fires that glowed off her skin, body and blade blackened with the dark blood of orc and hobgoblin, a monster had noticed their arrival. Superficially, it resembled the stoic warrior, Embla, that they had met on the road. It was the same general size and shape. It even had the same sword. There, however, the similarities ended. Every part of it was in furious motion, the muscles writhing such that they seemed likely to tear free of the bone, the limbs shaking their image to a blur. Horribly, its hands were almost still, the massive sword barely trembling as it was turned to face its next prey. Worst of all was the face, with one eye bulged almost from the socket and the other sunk inside. The veins along its temple pulsed so violently it seemed the skin might burst. Blood and froth already poured from its mouth, which had ripped apart at the cheeks, and the crimson gullet stared out like an eye from behind shredded lips. Harrah had previously assumed that the large woman they had met had been nothing more than a notably oversized human, a freak of nature. Bizarre, but comprehensible within his existing framework of how the world worked. Now he saw that this assumption was incorrect. Hundreds, maybe thousands of years ago, then there had been human blood introduced to this monster`s ancestry. Whatever they had mingled it with...now that, perhaps, was closer to what he was seeing at this moment. Step by step, the monster moved closer to the centaurs. Makkah had frozen in place and was making a low piteous whine in his throat, the sight too much for him. Harrah felt his own courage buckle under the strain. The irony was not lost on him. This was what they had risked their lives to save? Ridiculous! The only thing that needed saving was themselves! ***** The monster howled wordlessly at Makkah, but the centaur was in such a state of shock that he remained frozen in place, thereby saving his life. Harrah, having already panicked and regained some of his nerve, was less stoic and reflexively thrust out his front legs against the earth, forcing himself to all fours. The sudden movement drew the monster`s attention and it spun around at once, lunging at him with its sword aimed at his upper torso. With the burning tree fallen behind him, Harrah could not retreat, and had barely enough time to raise his club to block the attack. The very crudeness of his weapon saved his life, as the sword plunged itself into the solid wooden mass and stuck fast, with about an inch sticking out of the other side. Adrenaline surged and he pulled at the club with all his strength, seeking to disarm his opponent, or at the very least throw them off balance. The impaled club scarcely moved, for the monster had tried the same tactic, and in raw strength outmatched the centaur. Had Harrah not been using his greater weight to add leverage to his efforts, he would have been the one suddenly lacking a weapon! Might be it thinks less than a rock now, Harrah realised immediately. Can still fight proper rippa. Haf'ta try some dirty moves on this'un. In a single fluid motion, he stopped pulling his weight back, raised his hands over his head, and thrust himself forward as the conjoined weapons were lifted out of the way. Superior body mass won this contest. The monster struggled to remain standing against the impact, but overbalanced and fell back. The centaur, meanwhile, easily braced himself with his hind legs and did not follow his opponent to the ground. Two legs good, four legs better! Harrah thought to himself madly. Oh Hesh'love, it`s still holding the toothpick. The monster had indeed kept its grip on the sword, if not the ground, and even though it was lying prone under the centaur, was barely hindered in its efforts to pluck Harrah`s club from his hands. In fact, its furious thrashing had already landed the first hits of the duel, as it kicked out and struck at Harrah`s front shins and knees. He felt his front legs betray him far quicker than they had any right to, giving way under the repeated strikes and bringing him down before he could even try to reorient himself to safety. When his hind legs` scrabbling failed to keep his rear half aloft, and his side slammed into the earth and drove the breath from his lungs, Harrah`s fingers flew apart. At once, the monster rolled to one side, pulling the club away from him before he could recover. With terrible deliberateness, it turned its sword so that the club trapping it was parallel to the ground, and then kicked down. The sword resisted freedom for two further kicks, but when it was released and swung back for the killing blow, Harrah saw his doom reflected manifold amid the blood streaks. Time slowed, and Harrah wondered if his death might be quicker than those of the hobgoblins. Some had still been alive when the fires reached them, but with severed limbs and shattered bones, they could not have escaped. The monster had not cared to finish them off. Once they had been rendered unable to fight back, the sword had turned aside to claim a new enemy. A horrible way for anything to go, no matter what it had done in life. Certainly a fate that this young centaur had done nothing to deserve. Strangely enough, it seemed to Harrah that a tree was approaching the monster`s head. The tree was screaming too, which was particularly bizarre, especially since it sounded a lot like his own voice. Incredibly similar to his voice, merely raised to a painful volume. Realisation struck him at the same time as his brother`s club struck the monster`s head. It let out a surprised grunt and fell away from Harrah. "Soz, had a slight freak out there," Makkah said, his voice hoarse from the scream. "Stand up bro, d'ya want to have me say you were 'well done' cos of how cooked you were?" Harrah reached up to take hold of Makkah`s hand, words of gratitude failing him, when a flash of steel came between them. Makkah started screaming again, this time in agony as he reared up, clutching at the stump where his hand had been just a moment before. Impossibly, the monster had neither been killed nor incapacitated by the direct blow to its skull, and though its ear had been torn loose and its own blood pumped profusely from the wound, for the moment it showed no signs of stopping its relentless assault. This time, when it made a sound, there were words hidden in the noise, gargled in blood and spit in a foreign tongue that only it knew. Yet the centaurs understood the meaning well enough. The sword began to swing once more, whistling through the air in an arc that would disembowel the rearing Makkah, and leave it in the perfect position to come down in a decapitating blow for Harrah. The fallen centaur closed his eyes, shaking his head in futile negation. At the last, the shrill whistle changed to the sharp CLANG! of a bell. Harrah opened his eyes, then closed and reopened them again, not daring to believe what he saw. The monster`s sword still quivered mere inches from Makkah, but a spiralling wand of ivory was pressed against its edge, holding the terrible blade in place. The reverberations of this impact still lingered in the air. Around him, Harrah could sense the raging fires being quelled by a very familiar holy power. At the base of the spiralled ivory, a dark eye glared out at Harrah with more reproach than concern. "Every thanks I have, my lord Hengruen," the centaur breathed, almost inaudibly, to which the mighty unicorn gave a dismissive snort. It also gave a dismissive flick of the head, disarming Embla as if she were no more than a halfling child with a stick. Her sword, deeply chipped - for only the strongest of magical blades could sever the horn of a unicorn whilst it still lived - flew from her hands and far from her reach. A number of other unicorns, smaller and less majestic than their leader, appeared to stand guard over the blade. Several more, along with some fully mature centaurs, sped up to the wounded stallions and helped them away, with one of the unicorns touching her horn to Makkah`s stump and letting its magic seal the wound before he lost too much blood. This turn of events did more to delay Embla`s rampage than even her head injury. For some seconds, she stared uncomprehendingly at her emptied hands, before predictably balling them into fists. Though the unicorn Hengruen was not so tall as the centaurs, and so had to look up to meet her gaze, he was possessed of such a serene confidence that some semblance of warning broke through the haze of rage and rabies, and caused Embla to hesitate. She stood, shaking and confused, staring at nothing. A soothing not-voice drifted through the turbulence of her mind, using the All-Speech of the immortals, both sacred and profane. Had it been spoken to her aloud, Embla could not have understood it, though perhaps Aidan might have caught a word here or there. In the dialogue of thought, however, there were no barriers to communication, and unicorns, as agents of the celestial realms, had been given this gift so that none who served the powers of Good might be silenced to each other. Hengruen flinched at the mental bile spilling into his head. As one who had fought and banished several fiends in his life, it was technically far from the worst thing he had ever experienced, but it certainly was the vilest that had ever come from a mortal. Emotionally, that made this even more terrible. Under most other circumstances, he would have cast out this creature from his territory at once. However, there were a number of extenuating circumstances to consider. Her illness was but the least of these, alongside the fact that she had done much to expunge an evil today. His natural inclination towards mercy and forgiveness rested in the middle. His orders took ultimate precedence. He took a step forward so that she was within reach. She did not seem to realise, still ranting in her head - though Hengruen had closed off his own mind to it, unwilling to be further polluted - and spitting invective in her own language. It could be but the work of a moment to drive his horn into her belly or ribs, or up into her throat, and end her. That was not his purpose. His horn pressed against her skin, sending its magic into her ravaged flesh. To heal everything that was wrong with her was beyond his strength, even if he had spent the entire day channelling curative power for that express reason. He settled for the very worst injuries; the head, the split cheeks, the eyes, the unending self-destructive rage. The last of these was perhaps the most immediately important. With a gentle sigh, Embla crumpled into a heap. Less gentle snores drifted up to Hengruen, as he considered what to do with her next. She would need to be kept under watch for a day or two, whilst he and his brethren did what they could to heal all the wounded villagers of their physical pains, and begin the long and slow process of healing their mental ones. There was also the question of what to do with Zindri, whose disobedience had taken her and her companions into the heart of danger, and had cost Makkah a hand. "To the Hells with blaming yourself, stop that grovelling before he gets the wrong idea!" Isolde whispered urgently. Aidan ignored her and remained kneeling before the leader of unicorns, Hengruen, head bowed before these holy emissaries, lips moving in recitation of whichever hymns he could recall. The unicorns and their centaur allies had been only a few minutes behind them, dispatched to retrieve Zindri the moment her mother had learned of her disobedience. About half stayed to start healing the worst injuries of the rescued villagers, whilst the rest crested and then descended the hill to save Harrah and Makkah. The paladin had already bowed deeply, hand-over-heart salute, upon first sighting these creatures, but it was not until Hengruen had returned with two of his centaurs carrying the sedated Embla, and with Makkah missing a hand, that Aidan fully bent the knee to them. It had been his choice to bring Embla along for this, rather than insisting on immediate healing for her sickness, and the consequences of that decision were as much his responsibility as hers. Now, having explained as much, he awaited judgement. "No, I`m really completely serious!" confirmed Isolde in a mortified hiss. "Stand up right now. You are embarrassing me!" "The only mistake he`s made today is submitting to a jumped-up pony who ought to have been gelded and broken as a yearling," Isolde growled. "And you can stuff your self-righteousness into a nose bag and choke on it!" the halfling interrupted savagely, not intimidated in the slightest by the majestic celestial, or slowed by Aidan`s horrified attempts to silence her. "We risked our lives to save these people, while you star-eyed fillies left them to be...that! Things didn`t work out perfectly, no. Forgive us for being mortal and fallible." "At least we tried to do something. You? Where were you when the fresh dead were spitted like boar over the fires? Where were you when the wailing living were used as rags to be stitched back together time and again until they were no longer amusing? Prancing along a meadow whilst their families broke their backs to gather in a ravaged harvest and raise up new walls over the ruins of their homes." She paused only long enough to catch her breath, the unicorn waiting with shocking politeness for her to finish. "And you came to, what? To help, or to arrest the young ones? They are a thousandfold more noble than you, and a credit to their race indeed. A credit that I would be proud to stand alongside in defence against such as you! The only creature here that should be ashamed is YOU!" Isolde blinked, struck by the familiar title, although it was not quite how she had remembered hearing it. She was certain she had heard it before, and in remarkably similar settings to...wait! The last time she had been in Kelerak, during her brief stay as a prisoner of the Silver Duke`s treacherous seneschal. Had Isolde not heard the Silver Duke make mention, in one of his bouts of insanity she had thought, of a peace treaty he had been negotiating with a 'Striped Queen Ippotigris and her unicorn army'? And now, here she was, in the same region of Kelerak, with a considerable number of very competent unicorns around her, about to be escorted to 'the Ippotigrean Queen'. Coincidence was something Isolde believed in, but there were limits to this faith, and they had just been reached. That gibberish he spouted was a real thing? she wondered, stunned into silence. He wasn`t just imagining something completely ridiculous? What the...what? Broadly speaking, centaurs were all the same the world over, in the same way as humans or dwarves were the same the world over. Knowing this did not make it come as any less of a surprise to Brokk when the unicorn Hengruen ushered them into the presence of the Ippotigrean Queen, and he suspected he understood at last the strange appearance of her daughter Zindri. "Too bloody right we don`t!" Isolde was heard to grumble. "Shut it, Aidan, I`ll have my say, especially when I`m in the right." Brokk, ignoring them, was studying the royal centaurs, and Hengruen also, as closely as he could. Though biology was not exactly his area of expertise, it did not need to be for the wizard to identify the similarities his subjects shared. The queen had skin so black it was nearly blue, and her lower body was confusingly striped with white, but her general build and facial features were the same as her daughter`s. The silvered hair running through Zindri`s mane and tail was also a clear match with unicorn hair, and her pupils were not the circular points of her mother`s, but the stretched ovals of a horse. Small wonder Hengruen was in the lead for her retrieval, Brokk thought to himself. If he is not Zindri`s father, then he is her uncle. Oh no, what`s Isolde doing now?! "-and you should be proud of her for doing so," the halfling continued her diatribe, taking aim now at the Ippotigrean Queen. "You know who else obeys orders without thinking about them? Vale slaves! No questions, just obedience, and all of a sudden you end up with the Dark Occupation and four hundred years of suffering. What? You got a defence for that order, your majesty? Go on then, tell me what it is!" The Ippotigrean Queen, her face twisting into various expressions of distaste and anger, spoke sharply in a language that seemed to contain more hums and clicks than actual words. Brokk, being more familiar with languages than the others, realised that although she clearly understood Kelevan, the nuances of her response would be lost outside of her native tongue. Isolde began to make a sound deep in her throat, not unlike a copper kettle reaching boiling point, but this time, Aidan was ready for her, clapping his hand over her mouth and whispering furiously into her ear as she wriggled to break free. For a few moments more she continued to struggle, very nearly escaping his grasp, then suddenly settled, defeated by whatever he said. There was a grudging, half-satisfied smile on her face however, that Brokk did not particularly like the look of, but before he questioned that, there was something he needed to do first. "Your highness, if I may be so bold," Brokk began, stepping forward. "But I am troubled by some of these statements. What peace treaty did the duke break? How are you sure that the dark folk came from his estate, and had been sponsored by him, at least up until then? These are serious accusations, as I am sure we all appreciate, and I confess that I, if not my friends, require some more information. Might you enlighten us as to your people`s history with the Silver Duke?" The Ippotigrean Queen nodded approvingly. These were queries she could tolerate. With one final glare at Isolde, making sure the halfling knew to keep quiet, she began to speak, and Hengruen translate. The year was 8165, and the attempt by the monstrous Barghevor to retake Dragonspur had been pushed back, his army scattered and the cambion himself hurled back to his hidden fastness to scheme and plot. However, a sizeable contingent of his forces, rather than splitting apart, had been seen marching northeast in a strangely organised manner, despite the vast majority of their leadership having been killed in battle. Teventir Orcslayer, the fiercest warrior to have rallied to the cause of the Lords of the West, and who had led the mob which drove out the dark folk from Wyvernia, immediately set out in pursuit of these remnants at the head of three hundred hardened volunteers. Two days later, the news came that he had been had been slain in a duel at the Kel Crossing and his troops sent fleeing back along The Trek from the border of the Eaglesreach. It was Hengruen who was sent south to confirm the reports. And, perhaps more crucially, the rumours. It did not take him long to spot the convoy heading deeper into the Eaglesreach. It was impossible to miss, in truth. Hundreds of displaced dark folk, marching steadily to the very heart of the dukedom, unhindered by its patrols or residents, and led by a figure that none who saw him could fail to recognise. The Silver Duke walked, though he had a horse to ride, and as Hengruen continued to shadow the convoy, the unicorn observed the Silver Duke speaking amiably to the dark folk, even when they did not respond at all, or perhaps shied away from him as a beaten child might from a raised fist. Curiously, none dared to attack him, even though he was but a single old man and they were many, with legion-bred hobgoblins and even a few bazoks among their number. Instead, they seemed to treat him much as they might have a Hoth, and this alone would have intrigued Hengruen. For a few days, the convoy rested at the small township of Arbor, its citizens doing what they could to ease the pains of the dark folk. There was some grumbling, no small amount of hesitation, and a fair bit of caution from both sides, but Hengruen was startled to see how quickly and easily the Silver Duke had caused his people to take in those that, until just a few days earlier, had been coming into Kelerak for the express purpose of bringing the country back into the thrall of the Wintervale and its Lords of Sin. When the convoy resumed its course, irrefutably heading towards the ducal estate, Hengruen knew he had seen enough and heard enough to make his report. He also knew what would be his queen`s response to the appearance of so many dark folk near to their current territory. Next to her daughter, paramount in her mind was vengeance for what she had suffered, and for the devastation of her herd all those long miles away in the little-known land of Binjala. Outright war was impossible. There were simply too many of the dark folk and too few of the centaurs, even bolstered by their unicorn allies. Raids were reasonable, however, and ambushes aimed at sowing terror and confusion, and perhaps killing some of the new commanders. Worse, if the dark folk were being aided by the Silver Duke, and even his people, then even fleeing into Anaria would not be a viable option. The marital alliance between the Eaglesreach and the Cavebear Anarians had ensured that route of egress was closed off to them now. This type of subterfuge was not exactly pleasant for Hengruen, who was more used to declaring open challenges and vanquishing evil with considerable odds against him, but even a unicorn must be willing to put aside heroics to ensure his survival and that of his fellows. It did have one vaguely amusing outcome, however, which was that only the unicorns were ever remembered being at any of the skirmishes, and the first of these being known thereafter as the Unicorn Invasion of Arbor. Whichever way you looked at it, Hengruen concluded, there was something inherently funny about the phrase 'unicorn invasion'. For the seventh time that week, Hengruen thought that there was nothing quite so disturbing as the sight of a orc sincerely trying to smile reassuringly. They were simply not built to inspire anything other than fear and hatred in other creatures, and this scenario was not becoming any less unsettling for its growing familiarity. <Wipe that look from your face and speak your message again,> the unicorn instructed sternly. "Yessir yer honour, right away," the orc said in crudely accented Farlandish, evidently trying to impress the point that this was an important message. "Right, so it goes summat like this: 'This whole ignoring me is proper boring now. I`s just not unnerstanning why you ain`t wanting to at least have a chat. You`s a king, I`s a duke, we oughtta be having a chinwag before we goes straight to warring. If we two can`t settle this like grownup horses, what sorta hope is there for the world?'. That`s all of it, yer honour. He says he`ll be waiting at the same spot as yesserday. And the day before. And the day before that. You gets the idea, yer honour. Um, just so I knows, will you be sending me back and not killing me?" The unicorn turned, leaving the bound orc with his glowering centaur guards. They were less than pleased to have this creature here, so near to their queen, but orders were orders. 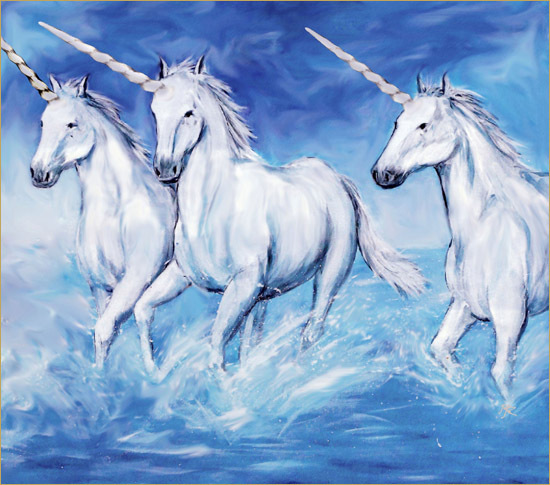 The first three messengers had been killed out of hand, but one of the unicorns had been out on patrol when the fourth was spotted, and had ordered its capture instead of summary execution. Each one had given much the same message. The Silver Duke was formally requesting a truce and a meeting between leaders, so that the raids against the dark folk in the Eaglesreach would stop. This tenth emissary was the first to have been brought this far. The others had been turned away further out, or killed when they become violent, but the consistency of the messages and the evident sincerity of the orcs had persuaded the unicorns to give them a further hearing. Had it not been for Hengruen listening to them and convincing the Ippotigrean Queen to do the same, things would never have gotten this far. Even now, she was less than pleased with the situation: "The servants of Sin have ever been a cunning and duplicitous horde of wretches. We can win this by continuing to fight as we have done. It risks everything to pause and speak to one who would as soon feast on your heart as lash you to a plough. But more important than that, it risks you." "If you are captured, it will not be because of the strength of arms he can bring against you, but the strength of magic as well," the Ippotigrean Queen cautioned. "I am no sorceress or shaman-queen, but even I know it will take a spell stronger than any that should exist in Kelerak to keep a unicorn, especially one like you, from just disappearing if truly threatened. If the Silver Duke has such power, then he has merely been toying with us all this time. Worst of all, if this happens...we are done. Our Zindri is done." Marius Sonnesberg XII, duke of the Eaglesreach, giggled much like a little girl. "But Teventir was one of the greatest warriors in all Kelerak. A terror on the battlefield. An elf with seven hundred years of experience. I am...none of those. Any duel between us would have been resolved in a single blow!" "I said 'now you can always look back on your actions'," the duke smiled, his tone nostalgic, before remembering he was supposed to be denying everything. "Or I said nothing at all. Because I wasn`t there, obviously. Are we actually going to be eating anything at this diplomatic dinner, or are we going grazing later? There are some lovely hibiscus in bloom at my estate at the moment. Never eaten those flowers before. Tried roses once, but I don`t like to talk about it much. Thorny subject, but aromatic aftertaste." "My first assurance is that I marched twenty miles with my back to three hundred of them just to reach Arbor," the duke responded sternly, abandoning his pretence and waving his cane forcefully at the unicorn. "And my second is that even the soldiers among them have lost any will to fight. Teventir and his ilk beat that out of them, and worse. They are refugees under my protection, and if you insist on continuing this campaign of persecution, I will demonstrate to you and your Striped Queen - oh yes I know of her - just how Teventir met his end." Hengruen lowered his horn in warning at the threat, intending to poke it in the general direction of the Silver Duke to remind him of his place. The cane flashed out at once, instantly turning the horn aside, and the unicorn let out a surprised whinny at the speed and grace of the movement. Some seconds passed, the two watching each other. At last, the unicorn stepped back from the duke, respecting the answer he had been given. The Silver Duke smiled. "We do indeed. I`m sure you know this already, but there is some excellent land in the eastern part of the dukedom. Human and hositan farmers, mostly. A good place for you and yours to wait for nothing to happen. Also I was completely serious, are we actually going to eat anything now, or..."
"I am not overly familiar with the languages of Eruna, but 'Lammiei' is not actually a Binjalan name, is it?" he asked, then glanced at Isolde with a frown. "What are you mumbling now? We didn`t quite catch that." The halfling had her arms folded, trying to look like she wasn`t sulking. "I just said it`s a lovely name. For a centaur." "I was taught that natives of that plane had a similar problem with elven names," Aidan interjected helpfully. "As the first to walk the mortal world, their spoken language naturally developed to be different to that of the gods, and attempts to reconcile the two led to the earliest form of what we today call the Old Speech." Although everyone looked at the half-elf in some surprise, it was Brokk who was most impressed. "They still teach that to you? Even the Sundered did not leave all their learning behind, it seems. Well, that is good news indeed. I had thought that forgotten lore doomed to gather dust in Gloralion or Kibil-Gund. If the ranarim still recall that, they may recall yet more that has been thought lost." Brokk shrugged uncertainly. "I didn`t have much time with my peers. Events...intervened. I ended up in Farland, then Zeland. The living were unreachable, and any attempt to contact the dead would have led to my joining them. Whatever postmortem pact they may have, I am unaware of it. And no, I cannot help you with it. Events, as I mentioned, intervened." "Yes? Oh. Yes! Of course." Aidan considered the matter, looking quite upset. "We, ah, well, we find ourselves in a very difficult position. Kelerak is on the verge of collapse, you appreciate? We came here to bring the Silver Duke to Dragonspur in order to, hopefully, stop a civil war from breaking out just yet. On behalf of Burcan the White, no less. If it turns out that this mad nobleman is still in league in the Wintervale, and we expose this...how can you ask me, us, to be potentially responsible for tearing apart one of the last hopes for peace in the kingdom?" Hengruen looked away. Instead, Lammiei the Ippotigrean Queen gave the brutally honest answer, in heavily accented but perfectly clear Kelevan: "We do not ask. We command. Evil may not hide. Hiding evil festers like sickness. It rots all, from inside to outside. Evil must be cut out like poison tooth from wound. More poison may come later, but what is there first must be taken first." "You end this evil. War comes to Kelerak`s barons. You do not end this evil? War comes from the east anyway. What you know makes you responsible now. Which war will you have Kelerak fight? The war against itself, or the war against itself and the east? Choose, but do not dare whine you cannot. Choice is the burden those like we must bear and may not throw aside for but a little time. Today, you rest. Tomorrow, you take your warmaid, and choose." Aidan blanched at these facts being laid out so coldly to him, and even Isolde had nothing to say. The royal centaur took several deep breaths, calming herself, whilst the others looked away out of respect. Hengruen alone caught her eye for a few seconds, and some personal communication passed quickly between them. "Before you leave us, there is one more thing," Queen Lammiei said at last, in a softer tone. "Our Zindri. Without you...for her life, we give thanks, and for the lives of her friends, the brothers Harrah and Makkah, we say the same. Now, you are dismissed. All of you. Hengruen and I must discuss punishment for our wonderful, wilful, warrior girl." It was a subdued party of four that left the farmsteads the following morning. The mood had not been especially good since they had been reunited, whilst a very exhausted Embla - but now definitely cured of rabies, the unicorn healer reassured the others - was busy having half of her scalp and ear sewn back on by one of the centaurs, and provided just enough magical healing to speed up the recovery process without having all of a unicorn`s energy expended on her, as there were others in no less dire need. With Embla`s memory having been severely impaired by her illness, only the briefest of flashes coming back to her, talk had naturally turned to everything that had happened for the last week or so. She had expressed enormous remorse at the worry and hurt she had inflicted on her friends, and especially the amputation on Makkah, but these positives had quickly been overshadowed by a black cloud. "The unicorns said you wanted to leave the farmers behind," Brokk had explained. "That they did not fight hard enough to be worth saving, and that that`s why I had to force you to fight." Embla had sneered at that, an ugly expression made uglier by what she had answered the accusation with: "I stand by every word I said. We should have left the filth to the fate they made for themselves. Had you not stolen them away, Isolde, I would have killed them myself! Orc and goblin, human and halfling, with no difference. All should have burned and bled, as you let me purge Mavarra!" Isolde had clapped her hands to her ears and fled in shock. Disgusted beyond words, Brokk followed, and even Aidan could muster no more than a horrified 'What are you?' before he too left. Suddenly they had realised that the emotional scars that Mavarra had left upon them were quite different to the ones it had left upon Embla. They had caught a glimpse of the darkest evil in their own hearts, the willingness to kill in the most brutal of ways and the unjust urge to let many innocents suffer so that one villain could be brought low. That was not what had eaten away at Embla thereafter. For her, it had been seeing how easily the people of these lands had fallen under the sway of a power that did more than oppress them, but demean and degrade them as a matter of course, with the same ease and lack of thought as breathing. The horror had been at how Mavarra was a perfect metaphor for the Occupied Kingdoms as a whole, where the very will to resist had itself been subjugated. And her companions? As she saw it, they skirted the very edges of how life ought to be lived, yet cringed away at the last in cowardice and ignorance. The evil that Aidan, Isolde, and Brokk had encountered was the one they carried with them, in the temptations of the mortal that made the powers held by the Lords of Sin so darkly attractive. The evil that Embla had encountered, that was prosaic, even non-existent by comparison? Vulnerability and weakness to a force greater than yourself, and the rational desire to preserve oneself at the cost of dignity and honour. Understandably, with this new realisation, the four friends were left in something of an uncertain position with regards to each other. There was not even time enough for them to work through it all at their own pace, for they would be back at the Silver Duke`s estate by mid-afternoon. There to investigate, to confront, and perhaps, to battle the last hope of saving Kelerak from itself. "So you aren`t actually denying it? Any of it at all?" The Silver Duke shook his head, smiling broadly at Aidan. "Perhaps you see now why I wanted you to go out to the Hynaphlund. I wanted you to see the sort of thing I am blamed for, both at home and further abroad in Kelerak. And so very much of it is true, as well. Quite distressing." Aidan visibly struggled to find the right words for what he was feeling, but the Silver Duke nodded understandingly and stood up, beckoning at them to follow. Isolde already had her hands near to her daggers, and Brokk was mentally readying himself for the sudden need to use magic, but Aidan looked to be taking a page out of Embla`s book and had balled up his fists, fighting to restrain himself from leaping on this crazy, polite, treacherous old man at once. Walking sedately, straight-backed, his cane more a prop than a necessity, the Silver Duke led them out of the main halls of his estate to some that were clearly less frequented by guests. At every intersection and room, there was an upsurge in tension as one or more guards or servants, ever more of them either partly or entirely orc-blooded, appeared in front of them and were calmly greeted and passed by. Many were clad in garments with designs that were wholly foreign to the eye, and bore no resemblance to the styles of either Liberated or Occupied Kingdom. The decorations and even the building had changed notably as well, with panelled walls of strange-hued wood replacing the bricks and stones, and paper-like partitions that were opened by being slid on to one side instead of proper hinged doors. Windows became replaced with murals of muted colours and fantastical scenes, depicting plants and beasts unknown, brightly illuminated by paper orbs that were clearly some kind of lantern. Embla`s eyes darted across all this, showing recognition and interest, but the others may as well have been looking at images from another plane. After a few minutes of progressive weirdness, they emerged into a large room that was clearly a shrine of sorts, utterly bare of decoration or furniture. The far end was dominated by a large statue, perhaps twelve feet tall and carved from a single block of obsidian, of a stern-faced oluk warrior in the unmistakable armour of the Blacksun Legion. He was shown sitting down, cross-legged, on a simple cubic plinth. In one hand he held a stone made to look like a cracked jewel, and in the other, a plaque whose message was inscribed in a dozen languages: Waste No Sacrifice. The Silver Duke approached the statue slowly, with obvious reverence, and knelt down before it. He murmured something inaudible, a prayer perhaps, and placed his hands on the statue`s feet for a few seconds before rising. "We are at one end of the estate," he said matter-of-factly. "The family mausoleum can be found just outside the walls. It was originally further away, but this was a more recent extension that my ancestors had not planned for. I don`t expect you to recognise who this is, of course, not by sight. But recognition is what he deserves. This is my teacher and my dear friend Tamarrik, oft-called the Reaver." "Butcher of a hundred towns, bather in the blood of thousands," Aidan growled, reaching out to grab the duke. Before his hands crossed half the distance between them, the Silver Duke`s cane had brushed them aside, following up with a hearty smack across the backside. Somehow, this threw the paladin entirely off-balance and threw him into the wall. As he regained his footing, he saw a pair of flashes dart towards the old man, Isolde`s aim as true as ever. At least at first. Then the duke stretched out a languid hand and caught the daggers mid-flight. Brokk began to speak the words of a spell, but the words died in his throat as the hilt of one of the caught daggers slammed into it, knocking the breath from him. The other dagger was returned somewhat less gently to Isolde, who had to jump aside to avoid the blade slipping into her ribs. She landed with two other daggers already in her hands, ready to carve and slice. "Is violence the only answer to this question?" Duke Sonnesberg queried, as Embla approached him. "I mean no disrespect by this, madam." This warning was one that Embla ignored, and she pushed forward, ready to seize the duke by cane and by throat, and render him helpless. Her hands closed on empty air and with a startled grunt, Embla suddenly found herself looking up at the ceiling, trying to work out exactly how she had been flipped onto her back so effortlessly. A moment later, Isolde was snatched out of the air and planted solidly on Embla`s belly, driving the breath from both of them. The duke, however, was not even out of breath after having so effectively manhandled the pair. Aidan lurched back into this humiliation and was promptly met a sharp rap to the forehead by the duke`s cane, leaving a bright red welt. The half-elf wavered for a moment, cross-eyed and stunned, then a hurricane of slaps across his cheeks sent him straight to the floor before he had even the slightest chance to recover his wits. Lips pursed in disappointment, the Silver Duke leaned down and took hold of Aidan by the wrist. "You had best remember this," the Silver Duke said. As Aidan`s hand was pulled inexorably onto the graven plaque, Brokk regained just enough of his breath to shout: "Don`t tou-"
His eyes were not his own. His ears were not his own. His thoughts were not even his own. They all belonged to the future, to the countless others who would follow him, be they human or elf or orc. That was the greatest wonder of this miracle he had been given. All who came after, regardless of who or what they were, could be taught. Tamarrik the Reaver, champion of the Blacksun Legion, once-Hoth of Gorug, had not feared death in decades. Blessed as he was, he did not fear it now either, though he sensed it drew ever closer. Memories are strange things indeed, he mused to himself. They are so fragile, yet dictate our every action. They suffuse our lives, yet leave no trace in the body. We cannot speak without memory of words, or walk without memory of motion. A warrior and a wizard alike are helpless without memory of their skills. To be a teacher is to be a champion of memory, to wage war against the oblivion that would claim the past. Perhaps I shall be the first to score a victory. A related thought occurred to him then. Ah, or is it the boy who shall be victorious, and I seen only as his tool? That is no less a triumph. A sword does not complain its wielder steals credit for the kill, or argue it could slay of its own accord. The two must work together. If I am but a tool, that is not a strange and new thing to me. Bred for one purpose, trained for one purpose - but not for this purpose. A tool indeed I remain, but for a nobler task than my owners would have allowed. The ancient oluk could feel the pressure of the eye-shaped pendant resting against his chest. It seemed far heavier than such a bauble ought to be, perhaps weighed down by the senses of those yet to come, partaking of the memories he was laying out for them. It was his responsibility, as the host, to provide a suitable repast for the guests, and so he made sure to take in as much of his surroundings as possible. It was the beatific barony of Greensreach that he beheld, from his post at the Carn Keler garrison, in the height of midsummer. A dawn chorus of worgs had woken the soldiers, briefly, before their handlers threw in an extra ration for them to gorge upon. This, as with much that happened under Tamarrik`s watchful eye, was entirely against regulations and carried severe penalties, but the oluk had no patience for such idiocy. Nominally, he was not the commanding officer, but his tremendous age and wisdom had engendered a respect from the troops that Commander Durz-Gha could neither comprehend nor ever receive, being far too fond of the stocks and the lash for even the slightest infractions, perceived or genuine. Therefore, in Durz-Gha`s absence, the garrison was able to vent the frustrations and urges they had needed to keep restrained, and Tamarrik made sure to encourage it all. There had admittedly been a nasty scene the last time Durz-Gha reported back to Green City, but it was mostly resolved now. Golbnag of the Bleakspear had promised to recite his poems from now on, which even Tamarrik had been relieved to hear (for as a formidable warrior and loyal battle-brother as Golbnag was, a bard he was not! ), and Kurzil had agreed to bite on a stick before calling out her pleasure. The pair would hopefully no longer be quite such a distraction as they had previously been, especially on those nights when Kurzil was in the mood for poetry before love. Less intimate releases, though no less important, were taking place throughout the garrison. Pash Worgbosser took the lead seven times in a row, with even his meanest fellow goblins admitted that there was nobody quite so fast on worg-back, at least not on this side of the Deadlands. Somewhere below them, a labyrinth of tunnels was no doubt being dug out and filled back in again by the kobolds pretending they were back mining for grubs in a respectable warren. To judge by the enticing smells coming from the mess hall, Janusz the Ladonite and Valerian Octavius, who hailed from the Far City itself, were performing culinary experiments with confiscated spices and herbs. Even the hobgoblins were relaxing with a makeshift tourney, wrestling and jousting and duelling under the tribal laws forbidden to the professional soldiers of Sin. All this, and more, Tamarrik observed closely as he made his rounds of the camp. To every soldier he offered a greeting, a compliment, a piece of advice, those little daily pleasantries so vital to morale. There was a general air of calm contentment that would not last, and everyone knew it, but for the time being, it was enough. Peace such as this was hard to come by, and none knew it better than the soldiers, whose fate would ever be death - either by the hands of rebels and outlaws, or by their own masters seeking to maintain control over their violent hordes. Tamarrik wondered if any of the Blacksun Kindred had ever died of simple old age in the service of the Wintervale. He did not consider it to be a very likely possibility. His own advanced years were more freak chance than a potential future for his orc and goblinoid cousins, and trolls were discounted from his thoughts - their constant and extreme regeneration meant that an incendiary or corrosive death often seemed to be the only way they could die, not that the brutes had the brains to appreciate their longevity. No, so far as Tamarrik the Reaver, at eighty-four years one of the oldest oluks ever to have lived, could foresee, the future held nothing but short and murderous lives of slavery and despair. Not just for his kindred, but for those they all too easily subjugated at the behest of their merciless overlords, and to forestall the wrath of the Darkest God, who cared no more for His twisted creations than for anything else. Chaos was spreading throughout the western realms. Elves had been seen openly in Kale for the first time in three centuries. Dwarves were claimed to be moving through hidden routes in Kelerak`s northern mountains. No reports at all were coming in from Daven, as the scouts were invariably eaten by the uncontrolled undead that now infested it. On this day, the last of his and many other lives, Tamarrik found himself hoping that Durz-Gha survived whatever upheaval was taking place. Should he escape Green City and get past Dragonspur, likely slipping over the border into Zeland, he would be arrested for not dying at his post. Then it would his turn to experience the more inventive punishments that could be devised for dereliction of duty, rather than inflicting them. In his case, they would even be justly administered. Pushing such pleasant thoughts aside, Tamarrik gave the garrison as much time to enjoy itself as he possibly could, before giving the last orders. Only when he was sure they were understood did he take his leave, marching westwards from the ruins to await the arrival of the invaders - or perhaps, liberators, depending on which side you were on. They were not long in coming, perhaps ten minutes behind the desperate flood of dark folk which the scouts had reported were trying to escape deeper into the country, and which passed him first, streaming into the relative protection of Carn Keler. Tamarrik was nothing more than a wizened oluk, bare-foot and bare-handed, but seeing him standing so patiently in their path caused the pursuing force to halt. It was predominantly a mob of villagers and townsfolk, with only a few true soldiers and mercenaries, most of them Kalish officers who had clearly been looking forward to something more than chasing down helpless refugees. At their head, mounted on a warhorse that looked better fed than most of the mob (and a fair few of the officers), was a scowling altarim elf, presumptuously having modified his wilderness mail to bear the legendary insignia of the Summervale Shadow Walkers - insignia which no true member of that fabled order would ever wear openly. "Kneel, orc, and we will grant you a quick death!" ordered one of the captains. "It does not understand so superior a language as Kalais, fool!" the elf scolded, looking at Tamarrik as if the oluk were something he had stepped in. "Nor should we waste the time attempting to communicate with such filth. My guards and I will exterminate this nest of vermin whilst you get on with catching the rest of those monsters." "Hile and well-met to you also," Tamarrik replied politely, though unwilling to resist doing so in perfect Kalais. "I formally request you stop trying to kill civilians and focus upon the armed soldiery at my back. It is a vaguely fairer fight." The elf stiffened, visibly offended that a mere orc was speaking in a language of culture. He gestured imperiously and two of his guards advanced on Tamarrik, swords drawn. They were almost upon him when the oluk bent his knees, grimacing at the creaking of his old bones. What came next would be more painful to him than his enemies, but he still had the strength and energy to fight this last fight. Tamarrik leapt, a salmon leap, over their heads. In mid-air he spun, with a single kick splitting both skulls straight through the helmets. He landed into a faultless balance on his other leg, a crane perch, and stretched out his hands to catch the falling swords of those that would have slain him. These he planted in the soil next to him, challenging any who dared to come and claim them. One did, a hard-eyed warrior who moved too lightly on his feet and held his spear too gracefully to be a common thug. He thrust it at Tamarrik, and the oluk bent his back, a reed in wind, at once dodging the blow and retaliating with a kick. The spear danced back as its wielder danced forward, catching the weapon at its centre and parrying the counter with one end. As that half of the spear rebounded, the other was swung around in a great arc that left the man open for half a second too long. The edge of Tamarrik`s hand caught him in the throat, crushing the windpipe. May your next life walk you further along the ki taote, young spear-dancer, Tamarrik grieved the loss of such a talent. An arrow flew at him next. He stretched out a languid hand, letting ki direct him to act in the precise way, at the precise moment, required. He did not need to think to act, in fact needed not to think to act. Tamarrik`s heart began its next beat and the steel arrowhead collided with his thumbnail, scraping only the shallowest groove in its surface as it was deflected up and away. In the same instant, or perhaps just before, Tamarrik flicked his wrist, a viper strike, lightly tapping the spinning arrow. It flew back at the one who had loosed it, and came to rest between his eyes. Tamarrik`s heart finished its beat. "I was clearly mistaken," Tamarrik said directly to the elf, in a tone calculated to rile him to misjudgement. "You had best turn around and leave. If your men cannot kill one old oluk, what hope have they against a garrison of younger orcs?" "More hope than they have if they anger me!" the elf screeched, gnashing his teeth in outrage. "All of you, go around that abomination and kill everything else, down to the last wailing spawnling you can find. I will purge this one myself!" The mob streamed around Tamarrik, rushing up towards Carn Keler. Hobgoblins stood at the gates and upon the ramparts, bunched together at the ancient breaches of the ruins, in the tested formations of charge-breakers and horde-slayers. The mob collided with the shieldwall and those in the front lines were immediately reduced to pulp by the pressing mass of those following them. Sheer weight of numbers overwhelmed the hobgoblins soon enough, however, for Carn Keler had not truly been a defensible position for several hundred years. The mob poured into the ruins and began to clash with the orcs waiting within. For the first few seconds of the engagement, those leading the charge could see many of the fleeing dark folk they had chased here disappearing rapidly, apparently just sinking into the very earth and vanishing with nary a trace! There was no time to ponder this oddity. Eager howls rose on the wind, and once more Pash was in the lead, bossing his worgs and their riders into the exposed flanks of the attackers. A few of the clumsier goblins still fell, but their mounts did not turn on them. Treated well, fed well, far beyond any official regulation, the highly intelligent worgs had no animosity towards their riders - and human flesh was far more pleasant than that of goblin or orc. The Kalish officers fought back furiously, bellowing orders and standing firm in the face of this adversity. Not one took a step back, or faltered in their determination, and the mob took heart from their fortitude. What had very nearly become a rout instead became a slaughter. Worg and goblin, orc and human, all fell equally as the fortunes of war dictated - and there were more of the humans than of the garrison. Below, the elf continued to watch from atop his horse as several fighters, their mail also ostentatiously inscribed with the mark of the Shadow Warriors, surrounded Tamarrik. These, the honour guard, were less easy for the oluk to defeat. He could feel his bones and muscles protest the exertions, arguing that just because they had been allowed to keep the strength and flexibility of youth did not mean that they could maintain it without pause. Nonetheless, Tamarrik did not falter, the fighters breaking against him, rain against rock, eroding his strength piece by piece. The last of them fell, and only then did the elf move in, refusing to dismount for a proper duel. Again Tamarrik flew through the air, but this time his foe was prepared for such a move. The elf`s delicate blade dipped into the oluk`s thigh, drawing a line in blood up past to his waist and over his belly to the very bottom of his ribcage. No mastery of ki could save against a wound, and Tamarrik at last knelt in earnest at the feet of his killer. From Carn Keler, the victorious but confused shouts in Kalais and Kelevan told the pair of the fate of the garrison, and of the refugee dark folk. "Sounds like some of them got away," Tamarrik stated calmly, though his lifeblood was dripping from him. "You were so eager to kill one old man, you failed to slaughter the women and children behind him." "I will find and kill every last one of them, and the rest of your kind," the elf answered in oath-making tones. "It may take me the next thousand centuries, but neither shall this world see my back nor my eyes see blessed Faerie until nothing remains, save but the least fading memory, of you or yours! Such is the word of Teventir Rethrorniel of House Anthelivar!" Tamarrik smiled up at the elf, and let his ki reach out one last time to impart the final blow, spoken in the High Speech Altarian that would cut Teventir most deeply. "And thus is your doom revealed. Your wrath shall attract a storm, and it shall fall upon you with a fury beyond your understanding. Go then, fate-snared one, and walk in the shadow of what you have earned. Go, and when you look back on this day, know it was ever your actions that brought about your end." Teventir spat. He raised his sword. He brought it down. A blood-streaked pendant in the shape of an eye rolled away unseen. "-ch that stone!" finished Brokk, and Aidan`s hand jerked back from the plaque almost as soon as he touched it, Duke Sonnesberg releasing his grip at the same moment. The half-elf started a scream, throwing up his hands to block the sword aimed straight at his face, but stopped as he realised who and where he was. And more importantly, when he was. He looked up at the still-disappointed expression on the Silver Duke`s face, starting to piece everything together. He heard Brokk, the most recovered than any of them, resume trying to cast a spell, and knew he could not allow that. "Brokk, wait! We yield! We yield!" cried Aidan urgently. "We may actually be in the wrong here!" To his surprise, Aidan saw that Brokk was staring at him in shock, and had not understood a word he had said beyond the dwarf`s name. Come to think of it, Aidan would not have understood a word he had said either, for it was in no language he knew. Oh, he knew of it, certainly, none who had ever journeyed, let alone lived, in the Occupied Kingdoms could fail to have heard it almost daily. "Try again in Kelevan, paladin," the Silver Duke said gently. "I think he does not know any Dark Speech beyond that used in invoking especially dire curses." With an effort, Aidan concentrated on the language he was using, and did try again in Kelevan. Brokk did not look any less concerned, though he at least stopped trying to conjure a spell. Embla and Isolde picked themselves up, still fighting for breath, and joined Brokk in staring worriedly at Aidan and accusingly at the Silver Duke. Only now did the elderly man start to seem tired, his exertions evidently catching up to him. "Tamarrik the Reaver came from Gorug," Aidan said slowly. "A city of the dark folk, in distant Yrrkune. A slave of the Wintervale from a nation enthralled to the Wintervale. He fought as you do." "I fight as he did," the Silver Duke corrected, speaking in short bursts as his weariness intensified. "He taught me but a little of what he knew. Enough to confuse most. You only know one way of fighting, what little skill I have is still overpowering. In short bursts these days. Very short. Not hositan short. Hositan tall by comparison." "It was the kobolds, wasn`t it?" Aidan asked, and the duke nodded. "They hid who they could in their tunnels. That was what Tamarrik had planned. Nobody who saw them disappear underground lived to tell Teventir. He could not finish the...the murders, he intended." "And many of those who survived the years kept hiding," the Silver Duke continued. "Most in Dragonspur`s Goblintown. Or here in my Eaglesreach. The dark folk speak to each other. Across the borders of dukedoms and baronies, and entire nations. When Barghevor`s army was scattered, they knew it would be safe here. Safer, anyway. For an orc, or a goblin, nowhere in the Liberated Kingdoms is safe. Any more than an elf or a human is safe in the Occupied Kingdoms." "Teventir pursued, like he swore he would," Aidan took up the story again. "You met him at the river Kel`s ford, the Kel Crossing. The border of your dukedom, where the authority of the barons and whatever sponsorship they gave to Teventir was ended. But he would have carried on anyway and anywhere. To kill them all. Man and woman and infant alike. So you killed him first." "I knew who and what he was," confirmed the duke with a sigh. "The victory at Carn Keler was sung of by bards for months thereafter. A key moment in the Liberation of Kelerak. I knew Tamarrik had been posted there. I went there as soon as I could. I eventually found the pendant. It was expensive to enchant. It was more expensive to transfer his memories to this plaque. To judge by your face, worth it at ten times the price." Aidan struggled to find the words. "He was an oluk. A servant of the Darkest God. He killed hundreds in his time. I should hate him. Now I felt his thoughts in my head and...I can`t. He sacrificed himself to buy time for people in need. Dark folk. But helpless. And one of my own would have seen them butchered no less hideously than if by the armies of Sin. I do not understand this. Any of this!" "Make no mistake, paladin," the duke said more firmly, already showing signs of recovering. "Tamarrik was an exceptional oluk in many ways. Even without the influence of the Wintervale, orcs and goblins will always have a blackness in their souls that cannot be cleansed. He had to fight against it every single day and did not always win. What matters is-"
Isolde interrupted: "He was mortal. He was fallible. But he tried. Is that what you`re saying? Ah Bunga damn it all. That`s the same thing I said to the unicorns. I hate having my words thrown back at me." The Silver Duke had strength enough for a short laugh at that. "Correct, little missy. He tried. So did those he saved, and the rest who came here, running from Teventir and others like him. I spoke to them as Tamarrik did. He is a hero to them, and as his friend, I was seen as the next best thing. They followed me. They made their homes here. They kept trying. Some, who did such evil in the farmlands, failed. They were punished for that. And now let me show you the leader of those who are succeeding..."
The Silver Duke placed his hand on the statue of Tamarrik the Reaver once more, this time on the cracked jewel held in the oluk`s other hand, and with a deft motion twisted it to one side. There was a faint creaking, and the subtle squeak of oiled wheels, and the statue rolled backwards into the wall. Beneath it, a stairway led down below the earth. Without further ado, the duke started down its steps, and Aidan hurried after him, both eager and afraid to learn more. The others, bewildered by the turn of events, followed more cautiously, and mainly out of the desire to keep Aidan safe if this was some especially elaborate trap - although, based on how swiftly they had been defeated by the Silver Duke already, it made very little sense for this to be a trap or ambush. Then again, as Isolde reminded them darkly as they descended, Marius Sonnesberg was crazy. Immensely talented, and extremely resistant to the frailties of age, but crazy. The duke made no effort to counter this argument, and if he had, the bursts of hysterical giggling coming from him would not have helped his case in the slightest. Fifty steps later, they were at the bottom, and standing in a hub of tunnels that reminded the four adventurers of those they had entered in Elder Daven. Those had grown up fairly accidentally, through the simple desire of nobility to have their servants out of sight as much as possible, in the backways and underpaths of their vast manors, which had slowly been joined together by the lower classes over the course of centuries. Here, however, there was clear intent. The walls had been chiselled out and reinforced expertly, marked with crude but legible maps indicating the next three junctions along any particular corridor, the same spherical paper lanterns illuminating the way from shallow slots in the floor. Now it was Embla`s turn to shed some light on this peculiarity. "Kunese lanterns. I saw these before. Before even I come to these lands. Your oluk teacher taught you more than fighting, old man. He brought much else he knew of Yrrkune with him to this country. You honoured him by making this part of your house like his own home in the east. Though Gorug is not so pretty as your house. Smells worse too." Everyone stared at her in surprise, though she ignored the stares and instead studied the wall-maps for a minute or two, until the Silver Duke decided to continue leading them deeper into this hidden half of his estate. It did not take them long to emerge into a respectably-sized room that was more than a simple intersection of tunnels leading in various directions and to various depths, but an actual antechamber of some kind. A purple-red curtain hung across the only other doorway, and several semicircles of plinths were arranged before it, resembling nothing so much as a crude vestibule in some temple. Aidan had seen similar rooms in the hidden churches where he had received his training, but even in those places there had been some small feeling of sanctity that was simply lacking here. The Silver Duke sat down on one of the plinths, tapping his cane firmly against the floor as he did so. There was a tiny but noticeable split in the stone there, worn away over the years by that firm tapping. Aidan joined him almost at once, with the others hesitantly following suit. Even in this time of truce, they still arranged themselves around Duke Sonnesberg such that they could defend themselves against any treachery he might show, with Embla positioned behind him and Isolde nearer than Brokk to one side, where she could leap out of the way of any attack and allow the dwarf to attack by spell. The curtain twitched, and three of the friends tensed involuntarily. It drew back, and they did not relax. That lesson had been learned quickly this day already. Just because the orc now emerging from the room beyond was clearly an aged and grizzled specimen, missing half his left arm and limping heavily, that did not mean he was not dangerous in some fashion. Aidan, however, looked ready to stand up and offer a helping hand, and was just as surprised by this as his companions. The old orc held up his remaining hand, shaking his head. Slowly, he turned to the side and pulled up his tunic, showing the hideous scar that coiled up from his leg along his flank, reaching back to his spine. The movement was stiff enough, controlled enough, that the ailment of this old wound was clear. The orc could either stand or lie down, but could not bend, and thus could not sit. "Vazzish here is the last bar myself who served alongside Tamarrik," the Silver Duke explained. "His mate died at Carn Keler. Their daughter lived. Then came the cambion Barghevor, his voice infused with the irresistible command of Sin. Vazzish could barely crawl, so the army cast him aside. His daughter died at Dragonspur. He has refused any further healing, mundane or magical, since that day. Vazzish, tell them why. Kingdom Common, not Kelevan, your tongue suffers that speech enough." The old orc looked each of the five in the eye, then slowly answered: "Pain hurts louder. More than voice of Sin in head. Voice say 'come, obey, kill'. Pain hurts louder than voice of God in heart. Voice say 'go, obey, kill'. Hear to voices, not hear to voices, orcs die. To elfblade, to dwarfblade, to orcblade. Voices not care, but pain stops voices. Vazzish have pain, Vazzish live. Dorg-Kaz have no pain, Dorg-Kaz die at Carn Keler. Galzin have no pain, Galzin die at Dragonspur. If Vazzish have enough pain, Dorg-Kaz and Galzin not die. Live in head, live in heart. Live in silence." When they were back in the surface part of the estate, the statue of Tamarrik sliding back over the hidden sanctuary of the dark folk, Isolde summed up everybody`s feelings succinctly. "I hate myself for feeling sorry for him, and I still hate him for being a part of the Dark Occupation. Things are simpler when it`s you or them, and they are soulless monsters to be killed on sight, if you can get away with it. Black and white is easy. Grey? What do I do with grey?" Aidan shrugged helplessly. "You`re touching upon moral arguments older than the dwarves. Perhaps even older than the elves, if we assume that the celestials of the Heavens had these same qualms when first they met the fiends of the Hells. If you ever figure it out, don`t keep it a secret. Heshtail knows the world could use some solid answers on something." "My people have solid answers," Embla protested, earning her worried looks from the others (and an interested one from Duke Sonnesberg). "Our answers are like stone. You are like air. It makes you weak. The Wintervale has stronger answers, but still wrong. They are like water. That is why they beat you, and why they dare not fight us. I had thought you knew this already?" This was an argument hinging on a degree of madness so extreme that even the Silver Duke did not feel inclined to start a debate, and whatever further lunacy Embla might have brought to the discussion - and whatever further revelations on the beliefs and misconceptions of her people might have emerged as a result - was left to the realms of imagination. Besides, there was a far more practical question that needed airing. "So, after all that has happened, will you be living up to your end of the bargain and coming to Dragonspur?" Isolde asked. "We sorted out the problem with the centaurs and the farmers. I can`t help but feel it`s going to recur at some point, but that`s technically not something I, we, came here to fix. Not right now anyway. But I know Aidan, and if he hears about your hidden bunch of dark folk breaking out again, he`ll be leading half the soldiers in Dragonspur here right after." "If he does, I will be waiting to school him again," Duke Sonnesberg said nonchalantly, as though the possibility was of no importance, and even Aidan was forced to admit that this was broadly true. "Promised to protect them, and I will, just like anyone else in my land. If some go on a rampage from time to time, I will treat them the same as any human or hositan in the Eaglesreach who goes and does the same. The barons will hesitate to act, for whoever moves in first will be left weak to the others." "And I will know what four people let the cat out of the bag, besides. Who puts cats in bags? Cats hate bags. They love mice and mice love bags, especially ones full of wheat. Of course, mice hate cats, if you think about it. The bags of wheat probably hate mice too. Just goes to show, one-sided relationships are damaging to everyone involved. What was the question?" Isolde felt a headache coming on, but asked it again anyway, this time refraining from adding anything else to it. "Oh, absolutely, you did what I asked of you!" he exclaimed, sounding surprised to have been asked. "Have to live up to my end of the bargain. Especially with a civil war to stop. Osbern is a good man, but a bit of a wet blanket when it comes to keeping the barons in order. Simply cannot do the job he is supposed to. You know that Starsul actually said to his face that he wanted the throne, and Osbern congratulated him for his honesty? Too many barons in this country, and all of them with ambitions of some kind, even the good ones like Felmund." "Ridiculous notion anyway, creating a new barony," the Silver Duke added, just a hint of gloating in his voice. "Especially with that candidate of all the possible options. Tried to tell them once, I did. Wouldn`t listen to me, oh no. 'Oh honestly Marius, you think we haven`t checked for demon-worship in his background?' Think they thought I didn`t like him for being an Anarian. Married one, haven`t I? He`s playing them for fools. Smarter than most is that Niklaus."